Arsene (Ariane Radio-Amateur Satellite Enseignement Espace) was designed and built by the French space agency CNES's radio amateur group (RACE), and was launched by the Ariane-42L H10 V56 launcher alongside Astra 1C, a TV satellite, into Geostationary Transfer Orbit (GTO) (223 × 36075 km, 5°) on the 12th May 1993 00:56:32 GMT. 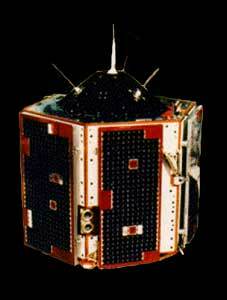 The spacecraft carried a VHF/UHF and a UHF/S-band transponder. The hexagonical cylinder which measures 785 mm in diameter and weighs 154 kg (74 kg propellant); at that time the largest amateur satellite launched. GaAs solar panels were used provided by the Italian space agancy (ASI). Following launch it was found that the VHF uplink receiver had stopped functioning, and the french DGE 10 m dish station at CEM near Toulon was made available. It allowed the mission to be recovered using UHF uplink and S-band downlink to fire the SEP Mars apogee kick-motor (15 kN thrust) on the 13th orbit placing it into a 17,200 × 36,830 km orbit. The spacecraft was used by amateur across the world, but suffered finally stopped functioning on the 6th September 1993 with a UHF uplink failure and two days later with a failure of the remaining S-band downlink. It is postulated that the VHF receiver failed due to a cable break at the low-noise amplifier, and that the S-band downlink failed due to overheating.